An attractive and generously proportioned, semi detached family home which occupies a favourable position within walking distance to both Estcots and Sackville school, as well as the town centre and train station. The property has been updated and improved in recent years and offers spacious living accommodation throughout. This briefly comprises: entrance hall with cupboard storage; downstairs cloakroom; living room open to the dining room and a dual aspect, modern fitted kitchen with door to the garden. 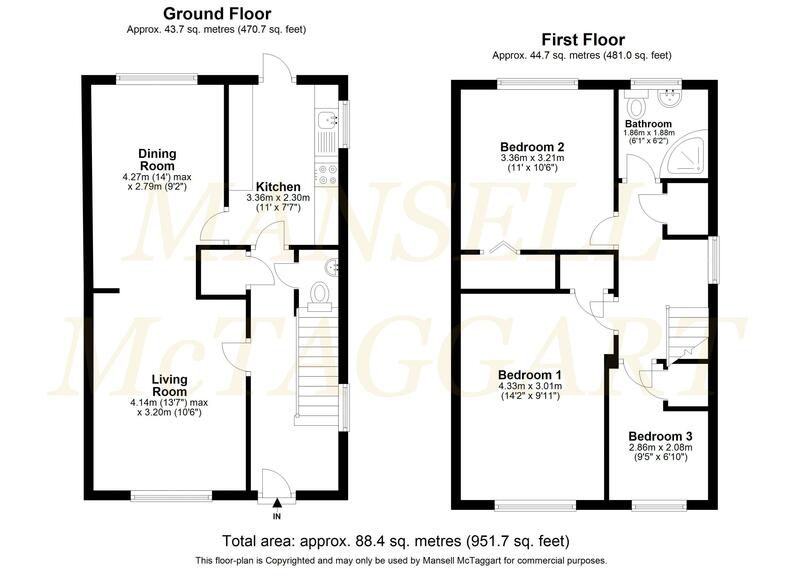 On the first floor there is a landing with cupboard storage and loft access with ladder; a well proportioned master bedroom with cupboard storage; double guest bedroom with built in wardrobes; further single bedroom also with cupboard storage and a refitted family shower room. Externally the property faces a green and has driveway parking for multiple vehicles, flanked by an area of lawn and leading to timber double gates providing access to the detached single garage with personal door and window. The rear garden benefits from a decorative patio abutting the property, an expanse of lawn, flower beds and borders plus a good level of seclusion. architectural heritage and is surrounded by some of the finest countryside in the South East, including the Ashdown Forest. There is a vast selection of shops, pubs, restaurants and coffee shops to cater for all. East Grinstead mainline train station provides frequent services to London (Victoria/London Bridge in approx 1 hr). Ideally situated for access to the M25/M23 motorway and Gatwick Airport. From our office on London Road, turn left at the mini roundabout onto the High Street and take the first exit at the next roundabout onto College Lane before turning right onto Estcots Drive. Take the first right onto Court Crescent and the property can be found on the left hand side, facing the green.